See photos from the retreat! Our hosts at the Painted Oak Nature School provide a lovely setting as we explore how children develop a foundation of academic skills and values through nature play. Presenters share insights and activities based on their work in nature preschools, forest kindergartens, or other nature-based preschool programs. Light breakfast and lunch are included, but please bring your canteen for drinks. You can indicate dietary restrictions when you register. The retreat is packed with hands-on, outdoor workshops including a teacher's tea party and music jam session around the campfire. Registration begins at 8:30 a.m. and our closing circle concludes at 4:30 p.m. Workshop descriptions are below or view the event schedule here. Sticks - the first tool, the first toy. Among its hundreds of uses are writing, counting, hiking, creating, building, and digging. Best of all, they are completely free! In this take away workshop, educators will explore "everything sticks" from an artistic view to common core. Inspired by the Coyote's Guide to Mentoring, these games teach children interesting facts about animals, improve gross motor skills, encourage quiet observation in the forest, and nurture joyful learning in the natural world. Games can be modified for any environment and offer ideas to bring back to any outdoor setting. Since we will play the games ourselves, be prepared to get active, make friends and have fun! 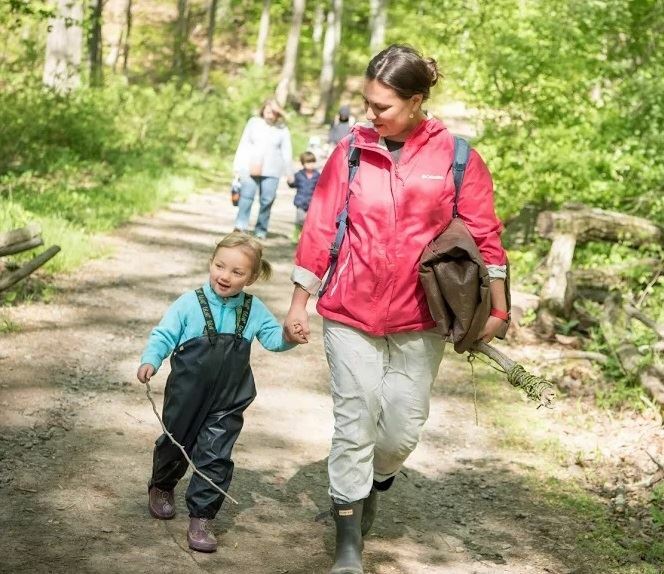 The natural environment represents a key connection children need for healthy development. Being outside allows children to invest hours of time in self-initiated work; hours that they do not even realize are passing by! These real-world challenges nurture a sense of accomplishment through problem solving, ingenuity, collaboration and a willingness to work through frustrations to fruition. Using images and video, this session depicts a long-term collaborative project, which demonstrates how children engaged with curricular content including math, science and literacy in authentic ways. Creating trust within the learning group is fundamental to creating a wonderful learning experience for all learners, especially in outdoor settings like nature preschools or forest kindergartens. We will explore how kindness and empowering language creates trust and builds connection and community. We will experiment with language and try some fun outdoor activities too! Tour the learning environment both indoors and out at the Painted Oak Nature School during a causal lunch. Come relax and enjoy a few cups of tea after lunch. Let the tea expert treat you to a few new flavors as we enjoy some interesting conversations as we get to know each other better. You might even be inspired to make your own tea on the trail with the kids. Heading outdoors, especially with children, means things can get messy. Of course! Let's reclaim the word and celebrate all that comes with it. In this session, we'll dive into creative prompts, children's books and a child-led exploration approach inspiring us to getting our hands dirty. Follow the journey of three teachers, who, along with their four-and five-year-old students, dramatically changed an outdoor space over several years. Originally an area with very little purpose or appeal, it has evolved into a patio space that incorporates various attractive design elements as well as ever-changing opportunities for exploration, observation, and building motor skills, as well as quiet contemplation, as needed. Let’s take art-making outside the classroom and off the paper… and send home projects that won’t fall apart. We’ll learn ways to prepare natural materials so they are durable for sculpture, and discover techniques for attaching sculpture elements more securely than with glue. Young children can use a hand drill, wire, and dowels to make amazing 3-D artwork inspired by animals and the environment— and they can make it all outdoors. Bring a "song in your pocket" and an instrument (yes, homemade ones you use with the children are great, too!). Share and learn the best nature-based campfire songs from each other during this informal sing-along.